An insurance Quote website has released a study that determines the Nation’s worst drivers. As expected there are some larger cities like Boston, Indianapolis and Milwaukee. 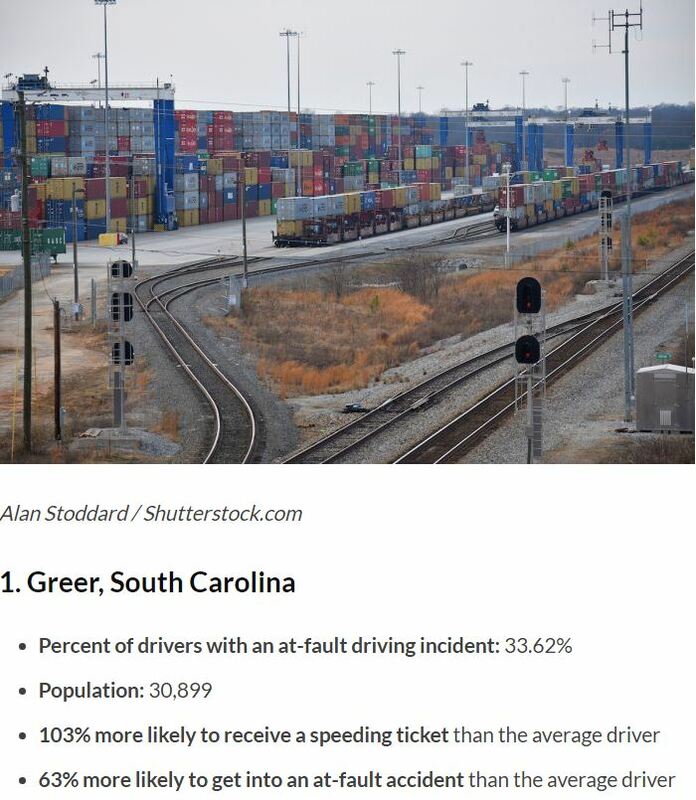 Those larger cities have nothing on Greer, South Carolina, Greer tops the list with the worst drivers in the United States. According to the study, Greer ranks at the top of the list for at-fault car accidents and at the top of the list for likelihood of receiving a speeding. In Greer a driver is 103% more likely to get a speeding ticker than the average driver and 63% more likely to get into an at-fault car accident than the average driver. Interesting is that Greer proper only boasts a population of just over 30,000. One has to wonder if it is actually residents of Greer that are getting into the accidents or people from neighboring cities like Greenville, Spartanburg, Taylors, etc. People from Columbia and the Midlands are happy as they did not make the list. About every six (6) in there is a car wreck in the United States. That is over 5 Million car wrecks per year. The statistics are staggering. According to the Highway Patrol, in 2017 South Carolina had 565 fatal car accidents with 613 people loosing their lives. So far in 2018 we have already matched that total of fatal car accidents at 565 and already have 607 car accident deaths. Unfortunately, 2018 is shaping up to be a deadly year. In an effort to counter these wrecks, the South Carolina Highway Patrol has released its summer time guide to safe travel to the beach. Ryan Montgomery Attorney at Law, LLC serves the State of South Carolina in personal injury cases, workers’ compensation claims, and car accident cases. With two offices, Columbia and Greenville, we can assist you with your injury case. All lawyers at Ryan Montgomery Attorney at Law are former insurance defense lawyers. That means we used to represent the insurance companies but grew tired of insurance companies not doing right by people in South Carolina. we didn’t like an insurance company taking advantage of people who do not know the law. We now represent accident victims- we now represent YOU. We offer a free consultation where you will actually meet with a lawyer not an “intake specialist” and we don’t charge you any attorney fee unless we recover money for you. If you would like to schedule a free injury consultation please contact us now.